These terms and conditions apply to the Unichip of North America (UNA) website located at www.unichip.us. This website is provided on an “as is” and “as available” basis. UNA makes no representations or warranties of any kind, whether express or implied, as to the operation of this website or the information, content, materials or products included on it. You expressly agree your use of this website is at your sole risk, by your own free will, and you are solely responsible for any consequences arising from this use. If you do not agree to these terms and conditions please do not use this website; we disclaim all warranties, whether expressed or implied, including, but not limited to, implied warranties of merchantability and/or fitness for a particular purpose. We do not warrant that this website, its servers, or its electronic communication are free of viruses or other harmful components. UNA is not liable for any damages of any kind arising from the use of this website, including, but not limited to direct, indirect, incidental, punitive and consequential damages. UNA reserves the right, at its sole discretion, to change or modify, add or remove portions or all of these terms and conditions at any time. It is your responsibility to check these terms and conditions periodically for changes. Your continued use of this website following the posting of changes acknowledges you accept and agree to the changes. As long as you comply with these terms and conditions, UNA grants you a personal, non-exclusive, non-transferable, limited privilege to use this website. Unichip computers, Unichip Plug ‘n Play kits, and other engine and exhaust components advertised for sale on this website are designed and intended for off-road applications only. These components have not been CARB approved and are not legal in California. Federal, state, local, or regional law may prohibit the removal, modification, or rendering inoperable of any device or component related to vehicle emissions for vehicles used on public highways; the vehicle owner is responsible for compliance with all applicable laws and may be subject to fines or penalties for violating them. UNA is not responsible for any penalties or fines resulting from an unauthorized use of its products. Please do not place orders on this website before contacting us if you do not reside in the US or Canada. Certain goods will not be shipped outside of the US or Canada. Your transaction will be voided and you will be liable for handling fees. UNA offers a one year manufacturer’s warranty against defective parts for new purchases by the original owner on all new parts advertised for sale on this website as well as a 90-day Performance Guarantee on Unichip and Unichip Plug ‘n Play products. Defective parts will be repaired or replaced at UNA’s sole discretion. If you encounter issues with any of UNA product contact jack@unichip.us with a description of the problem and a technical support associate will usually reply within 24-hours of receiving the e-mail. If the part must be returned for inspection, the associate will issue a Return Material Authorization number (RMA) which must be prominently written on the outside of the shipping container. A RMA is required for all returned items (items arriving at UNA without an RMA number will be refused without exception). Proof of Purchase is required for all returned items and must be included with the items. All electrical parts, including Unichip Computers and Unichip Plug ‘n Play kits, as well as any software products are sold as is and are NOT returnable for a refund but other parts advertised on this website may be considered for a refund. UNA will only consider refunds if parts are in original, unused, saleable condition. Refunds will not be considered after 15 days of receipt of purchase and will subject to a 15% restocking fee. Special order items, items on garage sale and items purchased as part of special offers such as internet forum specials and group buys will expressly not be refunded. Labor costs to remove and install any parts purchased from UNA will not be refunded. All other claims for missing items or error in shipment must be reported within 5 days of order receipt. With the exception of returns caused by our error, incoming and outbound shipping costs for returned items are the buyer’s sole responsibility. Refused shipments returned to UNA do not automatically qualify for credit. Any items left unclaimed at UNA will be discarded after three months. This includes items sent for repairs to UNA and which UNA quotes on without receiving a response within a three month period. All out of warranty parts sent to UNA for testing and inspection or updating are subject to the standard shop hourly labor rate. For 90 days following the original owner’s purchase of a Unichip, UNA warrants no other ECU product generates more power from a specific gasoline engine than a properly functioning, custom tuned Unichip in the specific vehicle for which it is tuned. If another ECU product generates more power from that engine within 90 days of the original owner’s purchase of the Unichip, the original owner can contact their Unichip dealer for a refund of all Unichip parts, Unichip installation charges, and Unichip custom tuning. Shipping, testing, dynamometer costs and the cost of removing any UNA parts are specifically not covered by this warranty and will not be refunded to the owner. To claim a refund, owners must provide dynamometer proof another ECU product produced more power when installed on the specific vehicle and that vehicle and all of its parts were in an identical condition other than the ECU enhancement. Three repeatable dynamometer tests must be performed using the Unichip and three repeatable tests using the other ECU product. The average of the three tests performed on each product shall constitute that product’s score for determining power. The same technician, using the same dynamometer in an identical condition with the same settings, must perform all test runs. All environmental conditions including ambient and IAT temperature and pressure altitude and the vehicle’s cooling system temperatures and drive train temperatures must also be identical for all six runs. IAT and Coolant temperature data logged information for each run is required. The vehicle must also use the same fuel for all six tests. 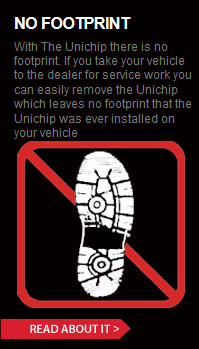 UNA reserves the rights to, at UNA’s exclusive discretion, re-tune the Unichip involved in a performance warranty claim at no cost to the customer making the claim or to provide a warranty refund; if after a retune, the Unichip still makes less power than another product, the owner will receive a refund IAW this warranty statement. All UNA parts, including Unichip piggyback computers, driver modules, and harnesses also carry a limited warranty against manufacturer’s defect. This warranty is valid for the original owner only, for one year from the date of purchase regardless of the installation date. UNA only warrants Unichip products sold by an authorized UNA reseller. If a UNA product is found defective, the original purchaser may contact the reseller from whom they purchased the product for a replacement component at no cost. Shipping, testing, dynamometer costs, and the cost of removing any UNA parts are specifically not covered by this warranty and will not be refunded to the owner. The above warranties are expressly made in lieu of any and all other warranties, express or implied, including any warranty on the engineering or design of the goods as well as the implied warranties of merchantability and fitness for a particular purpose. Any and all warranties on the Unichip are void if: (1) the custom installation or custom tuning of the Unichip was performed by anyone other than a UNA qualified dealer or tuner; (2) anyone other than a qualified UNA tuner or dealer alters or modifies or attempts to alter or modify any of the electronic data within the Unichip; or (3) the UNA product is used for anything other than its intended purpose or is physically or electrically damaged. For all warranty claims, the product return shipping date stamp must be within the appropriate time limitation from the time of purchase. Additionally, proof of purchase in the form of either a properly completed warranty card or a sales receipt indicating both the date of sale and owners name is required and is the owner’s responsibility. Customers with hard-wire installations are responsible for providing proof of when and where the installation was performed. Warranty claims will be denied if the customer cannot provide proof of purchase. UNA is not liable for incidental, consequential, or punitive damages attributable directly or indirectly to the Unichip or UNA’s actions or inactions with respect to the Unichip. UNA is also specifically not responsible or liable for damage of any kind (1) to a vehicle into which UNA products are installed or (2) resulting from the use of a vehicle equipped with any UNA products. UNA believes high performance driving should be confined to appropriate venues such as racetracks or organized closed course events such as Autocross competitions, and does not sanction or participate in any street racing or other illicit driving activity. To purchase the U-Tune Software, users must agree to the terms and conditions outlined herein. Selecting the “I agree” button on the purchase page is a contractual agreement by the purchaser that they have read, understand, and accept the terms and conditions outlined herein. This document and information provided with your purchase shall be maintained on file with Unichip of North America, Inc. (hereinafter UNA). 1. Definitionsa. “Licensee” is the person purchasing the U-Tune SW. The authorization to use the SW is not transferable to another person, entity, or organization without prior written authorization from Unichip of North America, Inc. (hereinafter called UNA).b. Software” (hereinafter SW) is the U-Tune SW or any derivative or revision past or present thereof. SW additionally includes any future U-Tune SW releases or updates which may be provided to or made available to the Licensee. Software also includes any manuals, guides, or materials provided with the SW either as distributed with the SW or provided for the Licensee’s use on the UNA website.c. “Unlock Code” is the password generated and provided to the Licensee to release the SW from the limited use mode initially provided. The Unlock Code is a one time use password only valid on the computer the SW is initially loaded.d. Distribution Region” is the United States of America and its territories, Canada, and Mexico.2. License specifications. Subject to this agreement’s terms and conditions, UNA extends to the Licensee a non-transferable limited right to use the SW for the sole purpose of tuning Unichip computers.a. Licensee agrees not to modify, reverse engineer, reverse compile, or otherwise disassemble the SW. Licensee may not use, reproduce, distribute, or dispose, in whole or in part, the SW other than as expressly permitted under this Agreement.b. Licensee agrees not to provide or attempt to provide, either intentionally or inadvertently, the SW or access to the SW to any individual, entity, or company engaged in automotive tuning either in part or full time. This includes employees of such companies and individuals who create or endeavour to create tuning software.c. Licensee acknowledges the SW and associated materials are proprietary to UNA and that UNA retains all right, title, and interest in the SW and materials including without limitation all copyrights, patents, trademarks, intellectual, and other proprietary rights. Except as expressly set forth herein, no other rights or licensees are granted or implied.d. Licensee agrees that the SW is for personal use on their automotive project or automotive projects they are personally working on. 3.Effective date. This agreement is in effect from the date and time the agreement was electronically accepted during the purchase process. 4.Termination.a. This agreement will continue until terminated as specified herein.b. This agreement will automatically terminate if UNA and all of its parent or sister companies become insolvent. If UNA is purchased by another company, organization, or individual, the terms and conditions herein are automatically transfer in their entirety to that company, organization, or individual.c. Should this agreement be terminated for any reason other than the insolvency of UNA and all of its parent and sister companies with no new company or organization having purchased UNA, all clauses from Section 2 shall survive until released by UNA or whatever company, organization, or individual purchases UNA. Orders typically process within one business day of receipt and credit cards are charged when the order is placed. In-stock items ship within two business days via the FedEx service selected by the purchaser during ordering. Unless otherwise specified, orders ship “Signature Required.” To waive this requirement, e-mail info@unichip.uswithin 24-hours of submitting your order clearly indicating your order number and desire to waive the signature requirement; UNA cannot waive the signature requirement without a confirmatory e-mail. If you choose to waive the signature requirement, responsibility and liability for delivery of the ordered items passes to the courier and delivery failure or damage claims are between the purchaser and courier. Ground shipments ship via FedEx from our warehouse in Hillsboro Oregon. Click here for the typical transit times. Shipping days are business days from when we ship your order, and do not include weekend or holidays such as Thanksgiving, Christmas, Memorial and Independence Day. Please add 1 – 2 working days from when you place your orders for us to process, package and ship it.